It's August 1970 and there are 600,000 people in a field in the Isle of Wight watching the biggest music festival that has ever been held. They will, over the course of the five-day event, witness performances from the Who, the Doors, Joni Mitchell and Leonard Cohen, and the last show by Jimi Hendrix. But headlining the second day are two anonymous Brazilians, joined by a troupe of naked dancers draped in red plastic. The pair start chanting in Portuguese, accompanied by African drums and jazz flute. Then they plug in their guitars and play a crazed set mixing psychedelic rock, funk and samba. 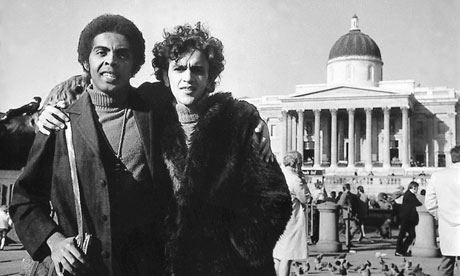 The two men are Gilberto Gil and Caetano Veloso. It will be some time before they are filling arenas around the world or, in Gil's case, serving as a minister in the Brazilian government. 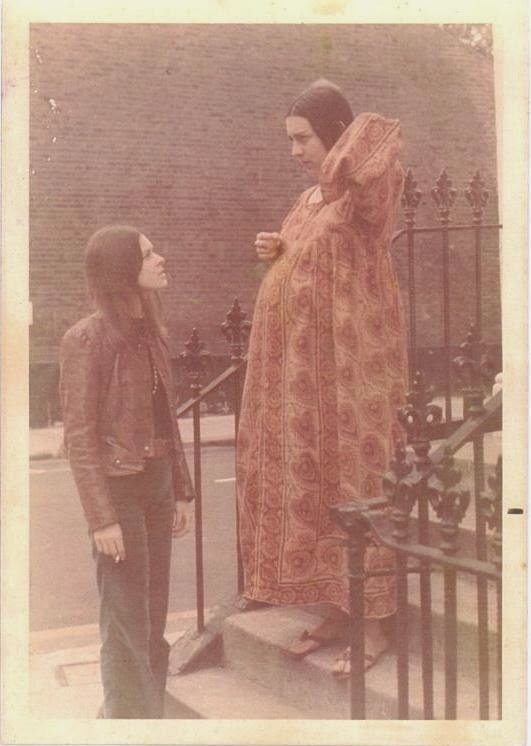 In the summer of 1970 they are merely exotic fixtures on London's underground scene, jamming with Hawkwind and hanging out in art galleries, hippy communes and music festivals. "I was astonished to discover how big these guys were," says Nik Turner from Hawkwind. "They seemed so humble, so generous, so eager to jam with anyone." 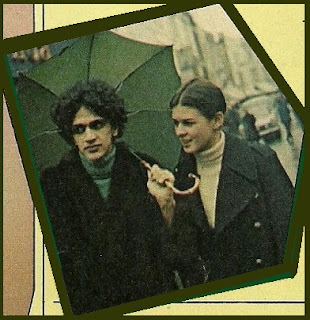 Only two years earlier, Veloso and Gil had been two of Brazil's biggest pop stars, leading lights in the slyly subversive Brazilian psychedelic rock scene Tropicália. That was until the military dictatorship decided they were a threat. In December 1968 they were arrested in São Paulo. They had their heads shaved, spent two months in prison and a further four months under house arrest. "The military wanted us to leave the country," says Veloso. "They let us play a concert to raise money for a plane ticket." As the rest of the world watched the moon landings on 21 July 1969, Veloso and Gil were preparing to leave Brazil. They wouldn't return for another three years. "Our manager went to Europe ahead of us to check where we would live," says Gil. "Lisbon and Madrid were out of the question as Portugal and Spain were under a heavy dictatorship. Paris had a boring musical ambience. London was the best place for a musician to be." 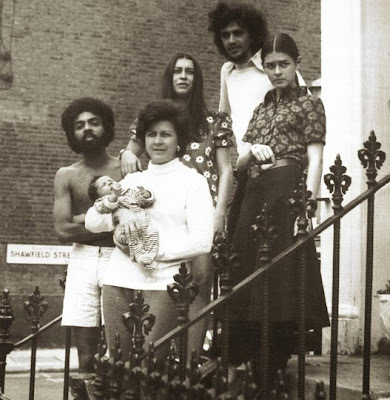 Gil and Veloso, their manager, and their respective wives, ended up living in a house at 16 Redesdale Street, Chelsea, London, a place visiting Brazilian friends would call "the Sixteen Chapel". Together they frequented museums, art galleries and football matches, and learned to love Monty Python's Flying Circus – Veloso says its surrealism influenced some of his more experimental music. 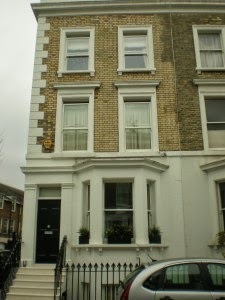 Veloso was depressed and homesick throughout his first year in London, while Gil was rather more upbeat. "We arrived the week the Beatles released Abbey Road, we saw the Rolling Stones at the Roundhouse, we jammed with great musicians, we met great people, we heard reggae for the first time," he says. "The fact you could walk up to a policeman and ask directions – in Brazil that just doesn't happen!" While in prison Gil had adopted a macrobiotic diet and started meditating and investigating eastern mysticism. 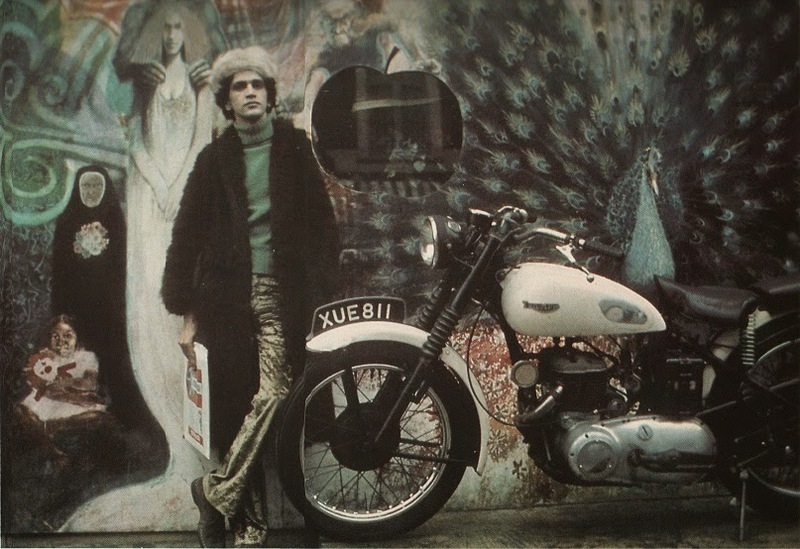 He arrived on a London hippy scene that shared his new interests, and quickly struck up relationships with many of the capital's key countercultural figures, including the anarchic journalist and singer Mick Farren, and Turner and Thomas Crimble of Hawkwind. Through Crimble, Gil got involved with a group of well-to-do bohemians who were setting up what would become the first proper Glastonbury festival. "The first time I visited the Worthy Farm site in the autumn of 1970, Gil was there with [Glastonbury festival co-founders] Arabella Churchill, Andrew Kerr and Thomas Crimble," says Bill Harkin, who designed Glastonbury's original pyramid stage. "They all spent months in Michael Eavis's farmhouse, smoking dope and discussing ways of making a free festival work. There were ideas about unifying spiritualism, the environment, art and music. "One of the models was the Brazilian carnival, a perfect example of a free, almost spontaneous, multidisciplinary arts festival. I remember having conversations with Gil about alternative medicine, whirling dervishes, music from Africa and India and Latin America, and music's power as a healing force. He was buzzing with ideas, and was crucial to the way the festival developed." Gil invited Veloso along to some of those early Glastonbury meetings – Harkin remembers Veloso suggesting that the main stage be shaped like a giant wigwam. "Everyone liked his tipi idea," says Harkin. "It very nearly eclipsed my pyramid. If things were different, 40 years on, we could be watching the wigwam stage!" Gil stayed on to perform at that festival, appearing briefly in Nic Roeg's Glastonbury Fayre movie. Veloso also made music in exile, but his tended to be more introverted. He jokingly describes his 1971 album, London London, as "a document of depression". 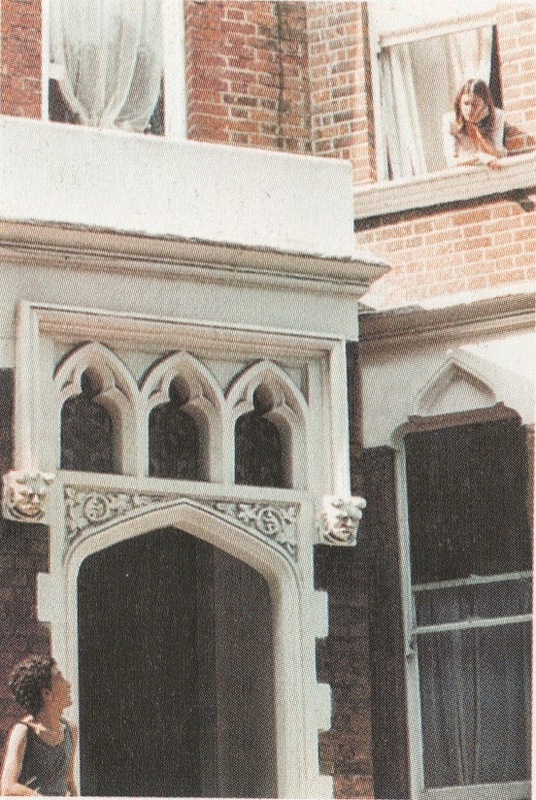 There are songs such as Little More Blue, with the lyric, "One day I had to leave my country, calm beach and palm beach"; and the title track, with the bittersweet lament "green grass, blue eyes, grey sky, God bless". "I had always admired British rock music," he says, "what I call 'neo-rock'. In London I got to see it close up: Led Zeppelin, Tyrannosaurus Rex, Pink Floyd, the Who, the Incredible String Band, Jimi Hendrix and, of course, the Rolling Stones. I learned that great rock was not about volume and wildness, but about precision and spareness. "I also learned about authenticity. I was initially reluctant to play guitar on my own records, and would delegate that to more skilled musicians. But producers convinced me that the frailties of my guitar style were part of the charm of the song. That was very liberating." Veloso still has a keen interest in British alternative rock, his 2006 album, Cê, borrowing from experimental post-punk. Gil's debts to his exile are more complex. His first London album, Gilberto Gil (Nêga), has him playing solo, acoustic versions of songs by Steve Winwood, the Beatles and Hendrix, but reggae became the most enduring legacy of his spell in England. "We were lucky to be in Notting Hill just as West Indian culture – Jimmy Cliff, Bob Marley, Burning Spear – was exploding," he says. "I was also fascinated by the whole Rasta cultural thing. It helped me to identify what was African about Brazilian culture." Gil would later take these ideas back to Brazil, engaging with black-Brazilian politics and pioneering some of the first samba-reggae hybrids. Both look back with fondness about their time in exile. "I never wanted to live outside Brazil," says Gil. "But London is one of the most interesting cities in the world, and I am lucky to have lived there." "It is only now that I can say that I like the music I recorded there," says Veloso. "The things we learned in exile made us more creative musicians. It also made us stronger people." © 2010 Guardian News and Media Limited or its affiliated companies. All rights reserved. Em 1969, os músicos brasileiros Gilberto Gil e Caetano Veloso foram forçados a deixar a terra natal. Seus anos em Londres influenciaram tanto a música brasileira quanto a britânica para sempre. Estamos em agosto de 1970 e há 600 mil pessoas em um campo na Ilha de Wight, costa sul da Inglaterra, assistindo ao maior festival musical já sediado no local. Eles irão, ao decorrer dos cinco dias de evento, testemunhar performances de The Who, The Doors, Joni Mitchell e Leonard Cohen, com encerramento por Jimi Hendrix. Mas, encabeçando o segundo dia, estão dois brasileiros desconhecidos, juntos de uma trupe de dançarinos nus envoltos em plástico vermelho. A dupla começa a cantar em português, acompanhado por tambores africanos e por uma flauta de jazz. Eles, então, plugam as guitarras, tocando um set insano, que mistura rock psicodélico, funk e samba. Os dois homens são Gilberto Gil e Caetano Veloso. Levará algum tempo até que eles comecem a lotar arenas ao redor do mundo, ou, no caso de Gil, se torne ministro no governo brasileiro. No verão de 1970, eles são apenas exóticos acessórios da cena underground londrina, tocando com Hawkwind e passando o tempo em galerias de arte, comunidades hippie e festivais de música. – Fiquei atônito ao descobrir o quão grandes eram os caras – disse Nik Turner, do Hawkwind – Eles pareciam tão humildes, tão generosos, tão ávidos por tocar com alguém. 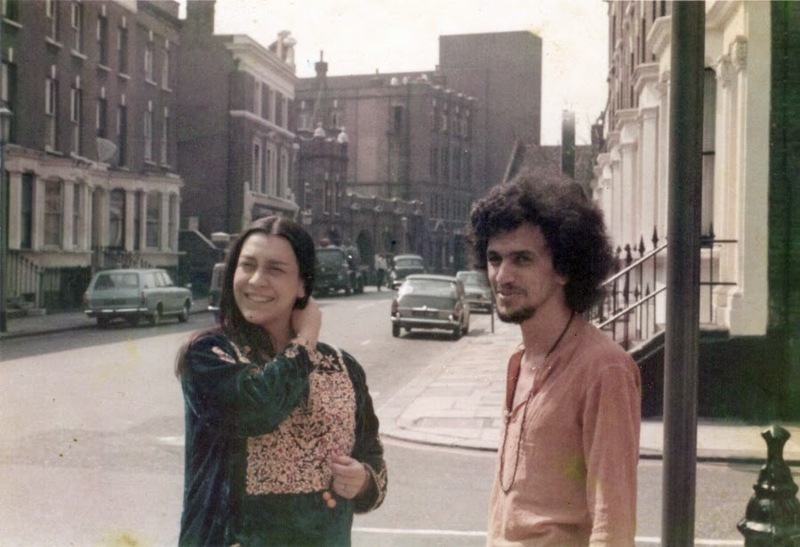 Apenas dois anos antes, Caetano e Gil eram duas das maiores estrelas pop do Brasil, guiando as luzes da ribalta na levemente subversiva cena de rock psicodélico brasileiro, a Tropicália. Foi assim até a ditadura militar decidir que eles eram uma ameaça. Em dezembro de 1968, foram presos em São Paulo. Tiveram suas cabeças raspadas, passaram dois meses na prisão e mais quatro em prisão domiciliar. – Os militares queriam que deixássemos o país – disse Caetano – Eles nos deixaram fazer uma apresentação para levantar dinheiro para as passagens de avião. Enquanto o resto do mundo assistia à chegada do homem na lua em 21 de julho de 1969, Caetano e Gil preparavam-se para deixar o Brasil. Eles não retornariam até três anos depois. – Nosso empresário foi à Europa antes de nós para checar onde viveríamos – diz Gil – Lisboa e Madri estavam fora de questão, já que Portugal e Espanha estavam sob forte ditadura. Paris tinha um ambiente musical entediante. Londres era o melhor lugar para um músico estar. 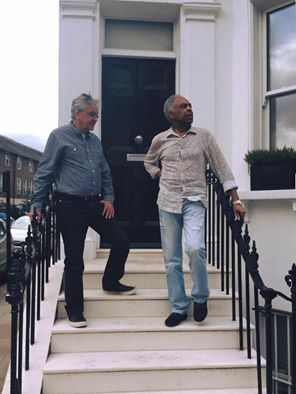 Gil e Caetano, seu empresário e suas respectivas mulheres acabaram vivendo em uma casa no número 16 da Rua Redesdale, em Chelsea, oeste de Londres, lugar que os amigos brasileiros visitantes chamariam “a capela 16”. Juntos, eles frequentavam museus, galerias de arte e partidas de futebol, e aprenderam a amar Monty Phyton’s Flying Circus – Veloso diz que seu surrealismo influenciou algumas de suas músicas mais experimentais. 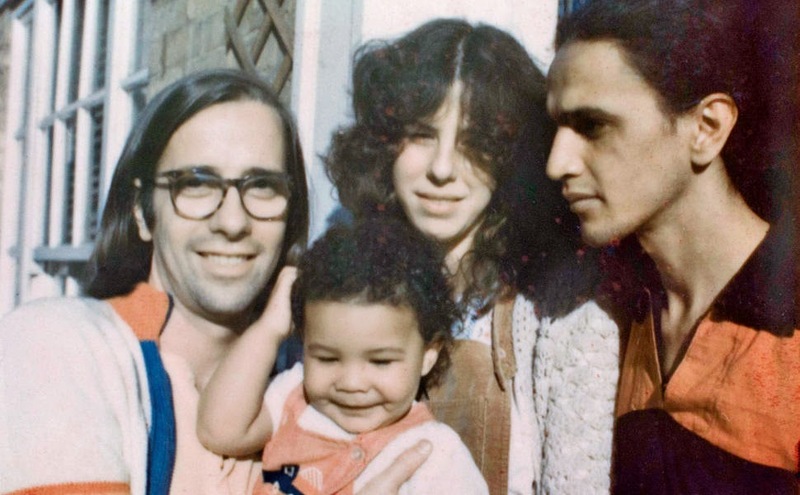 Veloso estava deprimido e sentia saudades de casa ao longo de seu primeiro ano em Londres, enquanto Gil era um tanto mais animado. – Chegamos na semana em que os Beatles lançaram Abbey Road, vimos os Rolling Stones na Roundhouse (casa de shows ao norte de Londres), tocamos com grandes músicos, conhecemos ótimas pessoas, ouvimos reggae pela primeira vez – diz ele – Você podia andar em direção a um policial e pedir orientação... no Brasil isso simplesmente não acontece! Na prisão, Gil havia adotado uma dieta macrobiótica e começado a meditar e a investigar o misticismo. Ele chegou em um cenário hippie londrino, que partilhava de seus novos interesses, e rapidamente engatou relacionamento com diversas das figuras chaves na contracultura local, incluindo o anárquico jornalista e cantor Mick Farren, além de Turner e de Thomas Crimble, do Hawkind. Por meio de Crimble, Gil envolveu-se com um grupo de boêmios bem nascidos que combinavam o que se tornaria o primeiro festival de Glastonbury. – A primeira vez em que visitei a Fazenda Worthy (local do Glastonbury Festival), no outono de 1970, Gil estava lá com [os fundadores do festival] Arabella Churchil, Andrews Kerr e Thomas Crimble – diz Bill Harkin, que desenhou o palco-pirâmide original do evento – Todos eles passaram meses na casa da fazenda de Michael Eavis, fumando maconha e discutindo maneiras de fazer funcionar um festival gratuito. Havia ideias sobre unificar o espiritualismo, o ambiente, a arte e a música. Um dos modelos era o Carnaval brasileiro, perfeito exemplo de festival de arte multidisciplinar grátis e quase espontâneo. Lembro de conversar com Gil sobre medicina alternativa, de dervixes em espiral, música da África e da Índia e da América Latina, e do poder da música como força de cura. Ele zunia com ideias, e foi crucial para o desenvolvimento do festival. Gil convidou Caetano para juntar-se a ele em alguma daquelas reuniões preliminares – Harkin lembra-se de que Caetano sugeriu que o palco principal tivesse a forma de uma oca gigante. – Todos gostaram da ideia de uma tenda indígena – diz Harkin – ela quase eclipsou minha pirâmide. Se as coisas fossem diferentes, 40 anos depois, poderíamos estar assistindo ao palco oca! Gil ficou para tocar naquele festival, aparecendo brevemente em Glastonbury Fayre, filme de Nicholas Roeg. Caetano também fez música no exílio, mas tendiam a ser mais introvertidas. 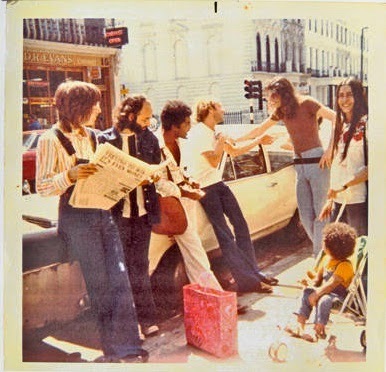 Ele descreve, fazendo graça, seu álbum de 1971, London London, como “um documento de depressão”. Há músicas como Little More Blue, com a letra "One day I had to leave my country, calm beach and palm beach" (Um dia tive de deixar meu país, calma praia e praia de palmeira); e a faixa título, com o lamento agridoce "green grass, blue eyes, grey sky, God bless" (grama verde, olhos azuis, céu cinza, Deus abençoe). – Sempre admirei a música rock britânica – ele diz – o que eu chamo de “neo-rock”. Em Londres, consegui vê-la de perto: Led Zeppelin, Tyrannosaurus Rex, Pink Floyd, The Who, The Incredible String Band, Jimi Hendrix e, é claro, os Rolling Stones. Aprendi que o bom rock não era feito com volume e fúria, mas com precisão e parcimônia. Também aprendi sobre autenticidade. Inicialmente, eu era relutante a tocar violão em meus próprios discos, e delegava a tarefa para músicos mais experientes. Mas os produtores me convenceram que as fragilidades no meu estilo de tocar faziam parte do charme da música. Foi libertador. Caetano ainda tem um agudo interesse no rock alternativo britânico, emprestado do pós-punk experimental em seu álbum de 2006, Cê. As dívidas de Gil ao exílio são mais complexas. 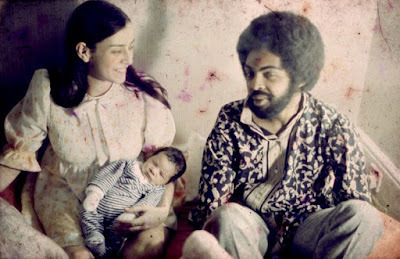 Seu primeiro álbum londrino, Gilberto Gil (Nêga), mostra-o tocando versões solo acústicas de músicas de Steve Winwood, dos Beatles e de Hendrix, mas o reggae tornou-se o mais resistente legado de seu período inglês. – Tivemos sorte de estar em Notting Hill bem quando a cultura jamaicana – Jimmy Cliff, Bob Marley, Burning Spear – estava em explosão – diz ele – Eu também tinha fascinação por toda a cultura Rasta. Ajudou a identificar o que era africano na cultura brasileira. Gil levaria depois estas ideias de volta para o Brasil, engajando-se em políticas a favor dos negros brasileiros e consolidando-se como pioneiro dos primeiros híbridos samba-reggae. – Eu nunca quis viver fora do Brasil – diz Gil – Mas Londres é uma das cidades mais interessantes no mundo, e tenho sorte de ter vivido lá. – É só agora que posso dizer que gosto da música que gravei lá – diz Veloso – as coisas que aprendemos no exílio nos fizeram músicos mais criativos. Também nos fizeram pessoas mais fortes. Terça, 8 de agosto de 2006. Dieckmann vira "tiete" de Caetano Veloso em evento. Durante a festa do 1º Prêmio Contigo! Pantene de Cinema, no Rio, a atriz Carolina Dieckmann deu uma de "tiete" do cantor Caetano Veloso, conversando com o músico e se deixando fotografar a seu lado. Veloso chegou a brincar com Carolina, fingindo que ela era Leona, sua personagem na novela Cobras e Lagartos, e dando um "tapa" na vilã. O músico aproveitou o evento, realizado na noite de segunda-feira, no Museu Histórico Nacional, para comemorar seu aniversário de 64 anos. Além de Carolina, Veloso bateu papo e se divertiu com a atriz e cantora Thalma de Freitas, conhecida por interpretar a personagem Baiana em Bang-Bang. E Caetano não saiu de mãos abanando da noite. O músico dividiu o prêmio do júri oficial de Melhor Trilha Sonora com Zezé di Camargo por 2 Filhos de Francisco. No dia em que comemorou 64 anos, entre abraços e beijos dos amigos, Caetano Veloso se revoltou com a proximidade de Carolina Dieckmann e tentou lhe dar um soco. “Você não, Leona!”, brinca o aniversariante. A atriz entrou na onda. “Cuidado comigo, seu Caê!”, diz ela, antes de cair nos braços do amigo. “Estou adorando o trabalho dela, Carolina é uma menina de talento extremo”, elogia Caetano. 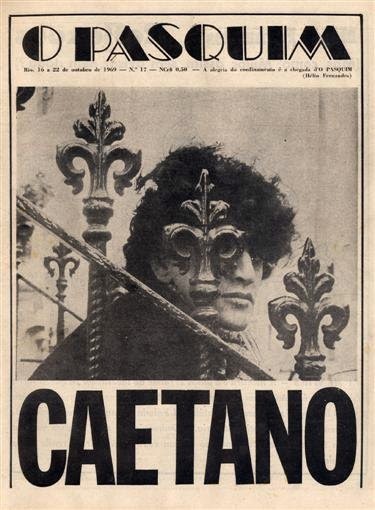 O aniversário de Caetano começou a ser comemorado um dia antes. O cantor e compositor recebeu um jantar em família, na casa de ex-mulher, Paula Lavigne. Além dos filhos, contou com a presença da neta. Na noite seguinte, foi reverenciado por amigos no 1º Prêmio Contigo de Cinema Nacional, no Museu Histórico Nacional, no Rio. Ao lado de Zezé Di Camargo, o cantor recebeu o prêmio pela melhor trilha sonora em 2 Filhos de Francisco. Cacá Diegues puxou o coro de ‘parabéns a você’, e seguiram-se os abraços. “Gosto de festa, das pessoas. Eu era louco por Xica da Silva, um dos filmes homenageados da noite. Gosto de cinema desde menino”, diz. Separados desde dezembro de 2004, após uma vida conjugal de 19 anos, que gerou os filhos Zeca (14) e Tom (9), a empresária Paula Lavigne (37) e o cantor Caetano Veloso (64) vêm demonstrando que superaram os problemas iniciais causados pelo fim da relação. Na semana passada, depois da sessão especial do filme O Maior Amor do Mundo, de Cacá Diegues (66), eles saíram do Cine Estação Ipanema, no Rio, de mãos dadas e sorrindo. O ex-casal, que nunca assumiu nenhum relacionamento posterior, foi embora no carro da empresária. A noite cinematográfica é mais um indício de que os dois vêm se reaproximando, embora não falem em público sobre reconciliação. Na semana anterior, no dia 7, Caetano escolheu o apartamento da ex para comemorar o seu aniversário. Primeiro, almoçou com os herdeiros e Paula; à noite, recebeu convidados para um rodízio de pizzas organizado pela ex. O bom momento deixa para trás o clima tenso que sucedeu à separação, quando Paula chegou a confessar que teve dificuldades para aceitar o fim e chegou a tomar remédios para dormir. Etiquetas: 2006, Caetano 64 anos, Cumpleaños, Prêmio Revista Contigo!